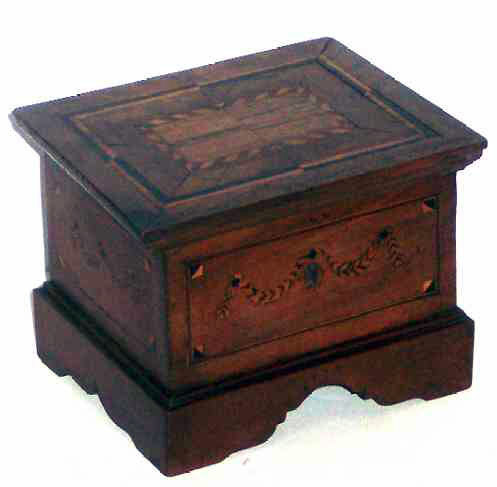 Beautifully done Sailor Made Walnut Miniature Chest with original hand colored paper lining and beautifully carved apron. Various Hardwood Inlays on the lid plus 3 inlaid panels (front and both sides) framing an inlaid swag. Not busy? . . . count the pieces! One sometimes wonders what lady inspired the devoted effort. This is truly a wonderful and RARE find! The condition is excellent with no missing inlay. Size is 6-1/2" long x 5" high x 5-1/4" deep.